• Exploded view and numbered list of all 74 parts for the RUGER®, Mark IV TM and 22/45TM models. • Card stock cover. Bright white paper. 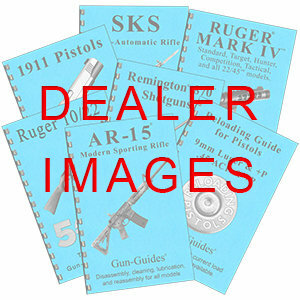 All references to RUGER®, Mark IV TM and 22/45TM Pistols are trademarks of Sturm, Ruger & Co., Inc. Gun-Guides and this publication are not affiliated with or approved by Sturm, Ruger & Co., Inc. Gun-GuideTM and Gun-GuidesTM are registered trademarks of Gun-Guides®, LLC.